Nebi Musa - (Arabic, Pronounced Nebi Moo' sah - literally - the prophet Moses. ) A Palestinian religious and national holiday that was the occasion in April 1920 of the first Palestinian riots during the British Mandate. These riots were instigated in large part by Haj Amin al Husseini and Aref el Aref, editor of the newspaper "Southern Syria." Evidently, British officers, especially Colonel Bertie Harry Waters-Taylor, who was General Allenby's chief of staff, encouraged and coached the rioters because they were opposed to the Balfour Declaration. The riots were carefully planned. Arab milkmen demanded their Jewish customers in the Meah Shearim neighborhood pay up their bills. They explained that they would no longer be selling milk in the Jewish neighborhood. Christian storekeepers marked their shops with the sign of the cross to protect themselves from looters. Nabi Musa was a pilgrimage holiday that flooded Jerusalem with Muslims. It had been instituted by Salah a Din to counter the large number of Christian pilgrims who swelled the city at Easter. The troubles began on the morning of April 4. The pilgrims were greeted by rallies and demonstrations that included incitement speeches and calls to massacre the Jews, led by Hajj Amin el Husseini, his uncle, the mayor of Jerusalem, Musa Kazem al Husseini and Aref el Aref. 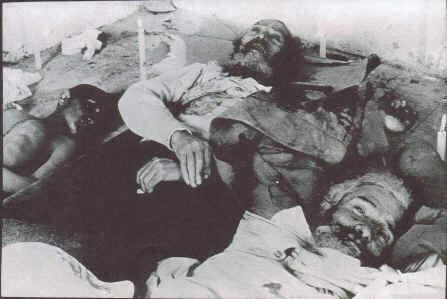 The Arabs chanted "Filasteen Arduna wa'al yahud Kilabuna" (Palestine is our land and the Jews are our dogs) "Itbach al Yahud (slaughter the Jews) and other slogans that became the hallmarks of such massacres. British police applauded. Ze'ev Jabotinsky, who led the Haganah, then a tiny force, met with Governor Storrs and offered to send in a force of volunteers, but the offer was rejected. The Arab mob raided the Jewish Quarter of Jerusalem, assaulted pedestrians and looted shops and homes. They ripped open quilts and pillows, sending up clouds of feathers as in Russian pogroms. A yeshiva was attacked and Torah scrolls were torn and thrown on the floor, and the building then burned. In the riots that day, about 160 Jews were wounded. "[A] riot broke out, the people began to run about and stones were thrown at the Jews. The shops were closed and there were screams... I saw a Zionist soldier covered in dust and blood... Afterwards, I saw one Hebronite approach a Jewish shoeshine boy, who hid behind a sack in one of the wall's comers next to Jaffa Gate, and take his box and beat him over the head. He screamed and began to run, his head bleeding and the Hebronite left him and returned to the procession... The riot reached its zenith. All shouted, "Muhammad's religion was born with the sword"... I immediately walked to the municipal garden... my soul is nauseated and depressed by the madness of humankind." The following day (Monday) the riots resumed. On Monday evening, the British inexplicably withdrew their police and let the rioters do as they pleased. In all, four to six Jews and four Arabs were killed and over 200 Jews were wounded. A large amount of Jewish property was burned or pillaged. Synagogues and religious schools were torched and Torah books were desecrated. The British responded to the riots by punishing the Jews primarily. Nineteen Jews including Ze'ev Jabotinsky were locked up for possession of weapons and for the crime of defending themselves. Richard Meinertzhagen, a fair if anti-Semitic British official who had informed the foreign office of the activities of Colonel Bertie Harry Waters-Taylor and the incompetence of the British administration, was transferred out of Palestine. Jews believed firmly that the riots were instigated and encouraged by the British. After the riots, Colonel Storrs visited Menachem Ussishkin, the chairman of the Zionist Commission, to express "regrets for the tragedy that has befallen us", Ussishkin asked, "What tragedy?" "I mean the unfortunate events that have occurred here in the recent days", Storrs said. "His Excellency means the pogrom", said Ussishkin. When Storrs hesitated to categorize the events as such, Ussishkin replied, "You Colonel, are an expert on matters of management and I am an expert on the rules of pogroms. The Palin commission which investigated the riots blamed them on Arab ire over the Balfour declaration. The government suspended Jewish immigration. Agitation for effective Jewish self-defense grew in the Jewish community. Morris, Benny, Righteous Victims, 2000. Segev, Tom , One Palestine, Complete: Jews and Arabs Under the British Mandate, Owl Books, 2001 p. 95. 'H - ('het) a guttural sound made deep in the throat. To Western ears it may sound like the "ch" in loch. In Arabic there are several letters that have similar sounds. Examples: 'hanukah, 'hamas, 'haredi. Formerly, this sound was often represented by ch, especially in German transliterations of Hebrew. Thus, 'hanukah is often rendered as Chanuka for example. ch - (chaf) a sound like "ch" in loch or the Russian Kh as in Khruschev or German Ach, made by putting the tongue against the roof of the mouth. In Hebrew, a chaf can never occur at the beginning of a word. At the beginning of a word, it has a dot in it and is pronounced "Kaf." u - usually between oo as in spoon and u as in put. ah- used to represent an a sound made by the letter hey at the end of a word. It is the same sound as a. Haganah and Hagana are alternative acceptable transliterations. 'a-notation used for Hebrew and Arabic ayin, a guttural ah sound. o - close to the French o as in homme. th - (taf without a dot) - Th was formerly used to transliterate the Hebrew taf sound for taf without a dot. However in modern Hebrew there is no detectable difference in standard pronunciation of taf with or without a dot, and therefore Histadruth and Histadrut, Rehovoth and Rehovot are all acceptable. q- (quf) - In transliteration of Hebrew and Arabic, it is best to consistently use the letter q for the quf, to avoid confusion with similar sounding words that might be spelled with a kaf, which should be transliterated as K. Thus, Hatiqva is preferable to Hatikva for example.